Another day, another berry pie. 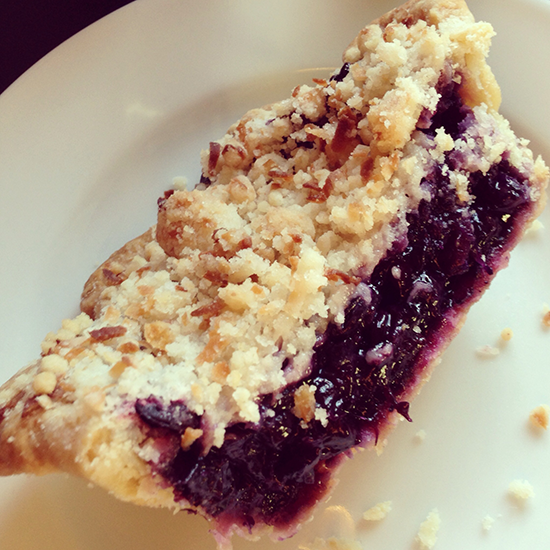 This time, it’s a Blueberry Pie with a hint of vanilla (my own addition to the recipe). It may seem repetitive after having just made a Blackberry Pie (recipe also from Simply Recipes), but when you’re on to a good thing, why stop? 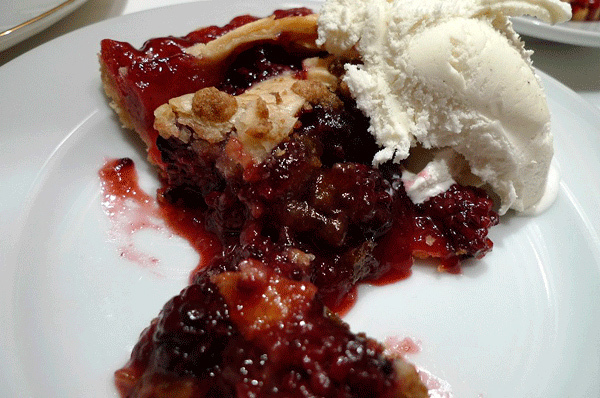 I sometimes forget how easy it is to make a pie (well, with a pre-made crust at least) and with this Blackberry Pie from Simply Recipes, it’s easy to make it delicious as well. Lemon zest, cinnamon, and almond extract add character to the flavor. Of course, this is best served warm with a scoop of vanilla. 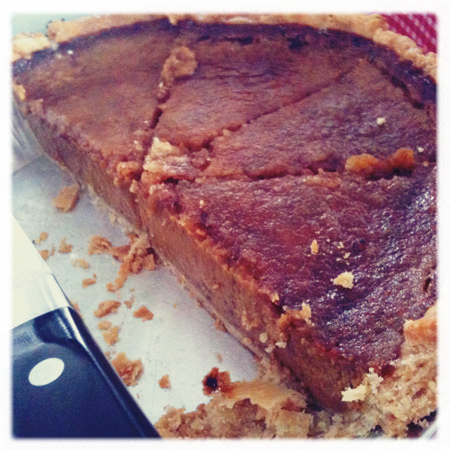 When I inquired about this beautiful looking pie at Blue Stove, the shop girl’s eyes lit up – “That” she beamed “is a sweet potato pie, and if you’ve never had one (I hadn’t) you don’t know what you’re missing”. She claimed it to be the bakery’s best – high praise for a place that continually churns out the city’s best pies. I was happy to find that praise wasn’t misdirected though. It’s a taste hard to explain – like an earthier pumpkin pie with maybe just maybe the slightest hint of citrus? 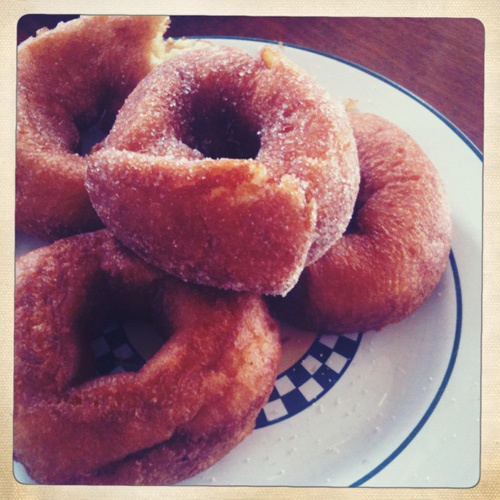 It was delicious for sure – those Southerns know their stuff when it comes to comforting sweets. 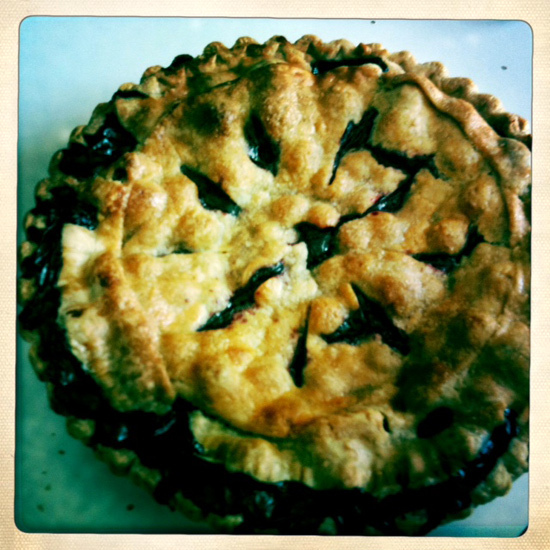 I am curious to make my own the next time pie baking calls. Any good recipes are welcome. My friend Jessica is a friend in deed. 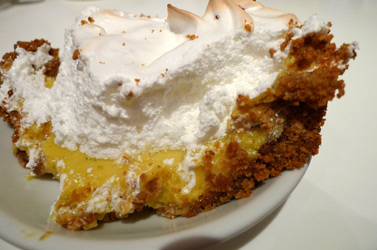 At my recent brunch party, she arrived with an incredibly delicious Lemon Meringue Pie made from scratch. She found the recipe online at Local Lemons via Tastespotting. 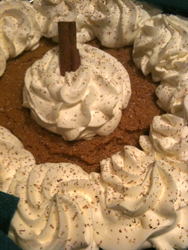 As a huge merginue fanatic, and a lover of sugary crumble pie crust, there shouldn’t be a happier treat for me! 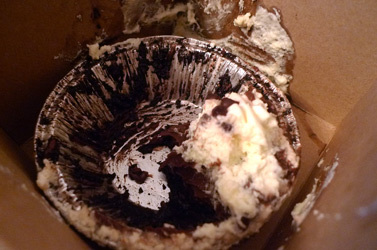 424 W 43rd St and 295 Greenwich St.
Our weekly Dungeons and Dragons games allow for lots of sharing of treats and recently our friend Joey brought along a wonderfully gooey Mississippi Mud Pie creation from the Little Pie Company, which has two locations in Manhattan. 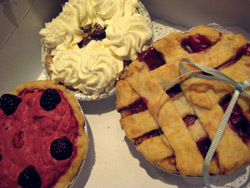 Made from scratch with fresh ingredients the pie makers have been in business since 1985, no small feat for any business, let alone a specialty store in the city but with pies this good, it’s little wonder they’ve become a new classic. I’ve also heard that end of the day, they offer discounts on their unsold goodies. 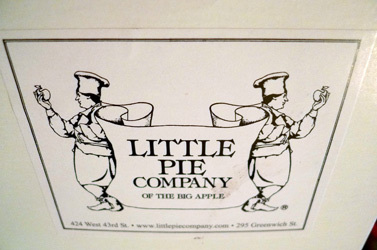 I will not resist the urge to spout a local newsworthy quip that the Little Pie Company is big on taste. 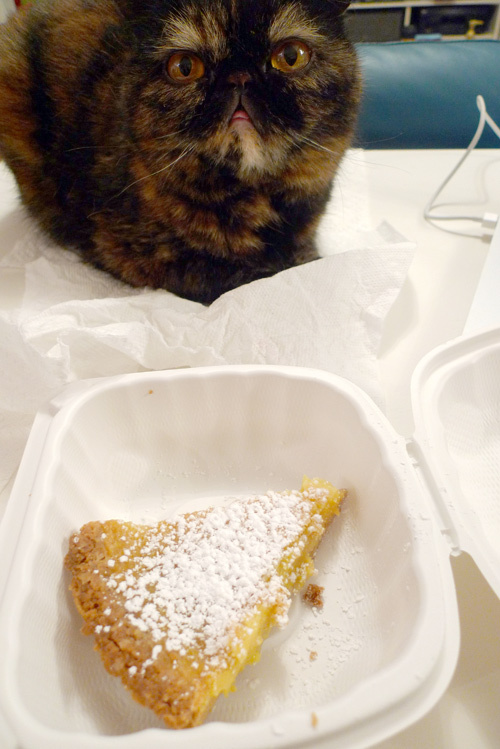 As you can see, the infamous Crack Pie from Momofuku Milk is like crack not only humans but apparently cats as well. I had a hard time getting a shot of the gooey, indescribably yummy dessert without Tiptoe interfering with a sniff (she likes to just smell, not eat human food). Of course, if she had eaten it, she would have known the glories of what can be done with butter, sugar, and eggs assembled in the most ingenious of ways. Just next door to Fanny is Blue Stove, a bright and airy bakery run by a friend of a friend (a lovely slave to the stove named Rachel) offering an array of home baked pies in unique and classic flavors like pecan (with an excellent sweet cream topping), cherry, key lime, and blackberry mousse. Just like Fanny, it's situation in a slightly less traveled section of Williamsburg makes it feel more like a secret spot frequented by in-the-know locals rather than a passing trend. There's no static menu, you're limited to ordering only what has sparked the baker's fancy, but I can promise (now having sampled three little pies, which was the perfect amount for a four guest dinner party) that everything is absolutely top notch. Before the bakery moved in to this adorable space with its a peekaboo pantry, black and white tile floors, beautifully aged pressed tin, and homemade welcome sign, the baker would take orders and deliver pies to those with a sweet tooth for fresh baked goods, building up a quite a reputation among those who prefer their pies without a lot of artificial junk. We loved the pies we grabbed to go, but there's an array of large tables should you prefer your sweet to stay with a cup of coffee or tea. The perfect fall dessert, Pumpkin pie is usually associated with Thanksgiving, but after finding the best version I've ever had at Blue Stove (with home made whipped cream and a rich, caramelized bottom-crust with a hint of chocolate) I'm hoping to grab a few of them for my lucky Halloween party guests – we'll just call them dead jack-o-lantern pies. Of course, if you are not near a bakery as good as ours, the classic Mrs Smiths has served me well for years. 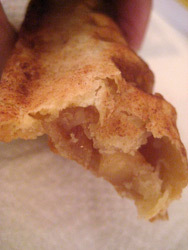 You can't get more American than (sort of) fresh apple pie from McDonald's. There's lots of online controversy about the rumor that the nearly seventy year old fast food chain uses potatoes flavored like apples rather than real apples; people cry foul play, but I say: what ingenuity! And what kind of genius can make a potato taste like an apple anyways? I hadn't had one of these cinnamony desserts in years and years and I thank Jim for waiting patiently while he got cut in line by vicious girl teenagers over and over to get one for me. Add vanilla ice cream and whipped cream.